Jumping on your bike in an ordinary pair of jeans seems like an easy option, but they won’t offer you much protection if you fall off. This is where a pair of kevlar jeans come into their own. Apart from the protection, Sartso Killer jeans are also available with a water resistant finish. All of Sartso’s products feature triple-stitched seams and most styles of jeans have pockets for knee armour. The Sartso jeans use lightweight denim for comfort, which is reinforced with a protective woven lining in all the major crash points. They come in blue or black and in a variety of styles, including regular, relaxed, loose or skinny leg, as well as a rigid or stretch design. I decided to take my new Sartso jeans to several world bike launches recently, starting with the BMW R 1200 R in Spain, followed by the Ducati Scrambler launch in the home of jeans – the United States. I’ll admit that at first, my decision was based on something other than suitability for the riding that was planned – and more for the need to keep my luggage to a minimum. The Sartso jeans were a lightweight option, weighing less than the other casual riding gear in my wardrobe. I hadn’t worn the Sartsos before packing them, so there was a certain amount of risk involved. I had a hell of a lot of riding to do, in unknown climates, and without prior knowledge of just how comfortable the jeans would be. Thankfully I ended up pleased with the decision to pack the Sartsos. Thanks to the stretch denim construction, there was no wearing-in period and they felt like an old pair of jeans, just as soon as my body heat had warmed them up to normal operating temperature. The fit and cut is something I particularly like – it’s neither hipster nor hippy – just built for a regular-Joe riding guy with a priority for comfort – proving it’s possible to have classic style without being a victim of it. I’ve practically been living in my Sartso Killer jeans since I received them six months ago. I’ve worn them pretty much seven-days- a-week, week-in, week-out, and they’ve been through it all: rain, hail, mud and sun – yet they still look like new. Even the reinforced stitching has remained white. I’m a big fan of the relaxed fit. It’s perfect when you’re throwing your leg over bikes of all different sizes. There’s nothing more annoying than wearing tight jeans on a tall bike. I found they’re a little tight around your boots, but that just helps keep the draft out when riding, especially if you’re on a cruiser – on which your legs are stretched out in front. The velcro on the knee pockets rubbed against my legs when I first wore them, but the velcro smoothed out after I washed the jeans, so it’s no longer a problem.Their water resistantancy is good for a climate like Melbourne – where you can have four seasons in a day. Theywon’t keep the rain out in a downpour, but they’ll keep your jocks dry in a drizzle. Kevlar covers all the major crash points and they also have armour pockects over the knees for added protection should you wish to insert knee armour. 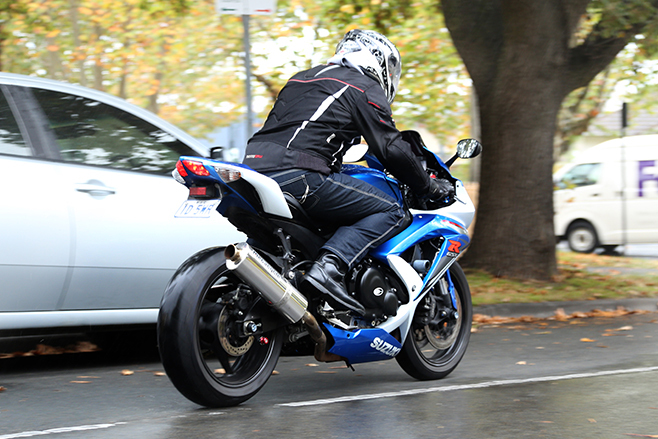 Considering I don’t live far from work, I usually chance getting soaked on my daily ride in jeans. If you’ve got a longer commute, a pair of waterproof textiles might be a better option. Mind you, off the bike, you’re restricted walking about in bulky and sweat-inducing textiles. And nothing beats jeans for having a coffee or beer at your favourite hangout. In the first few weeks, I wasn’t enamoured by the poke-in-the-eye looks of the white stitching – especially the swirl pattern on the arse. But the design has grown on me. 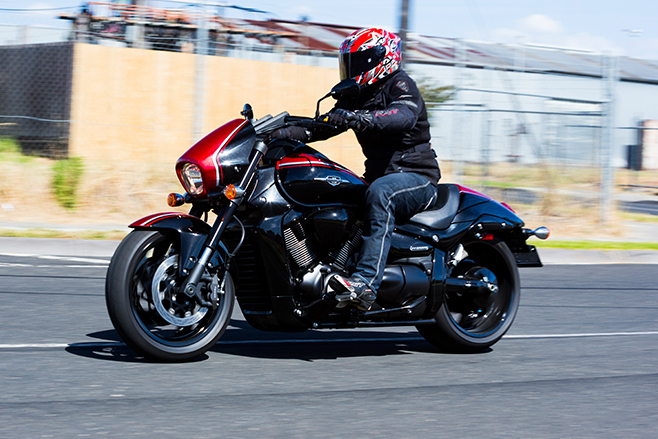 It makes you stand out from the rest, and isn’t that what most bikers and people aspire to? The Sartsos are comfortable and having a stirdy zip instead of fly buttons is a godsend. You’ll struggle to get them over the thick shin protector of a sports boot, but at least they won’t flap about. The only thing that’s been annoying me lately is that the waist button – which is extremely sturdy by the way – has twisted slightly and its edge is rubbing on my belly. I’ve since resorted to tucking my shirts under the jeans to cushion the rub, but that’s ruining my hipster look.